Afternoon truck traffic on I-5 south of Albany. (File photo from April 2015). Freeway drivers in Albany and elsewhere on the Oregon interstates will be interested in the state’s proposal to raise the speed limit for trucks. If it goes through, this should ease the congestion caused by slow trucks overtaking each other at leisurely speeds. ODOT is doing a study on “whether or not truck speed limits should be raised on the interstates,” and the agency says it wants public input. The study concerns those long sections of I-5, I-84 and I-205 where the speed limit is 55 mph for trucks and 65 mph for everybody else. The proposal under consideration is to raise the truck speed to 60 mph but leave the general limit unchanged at 65. ODOT’s Speed Zone Review Panel has scheduled three public meetings to hear comments. The first is on March 14 in Salem, at 5:30 p.m. in the ODFW Commission Room at 4034 Fairview Industrial Drive. The others will be in Hood River on March 20 and Medford on March 22. Written comments can be emailed to interstatespeedcomments@odot.state.or.us. Once the speed panel reviews ODOT’s engineering study and considers public comments, the panel will make a recommendation to the Oregon Transportation Commission, which has the final say unless the legislature says otherwise. On some of the highways in central and eastern Oregon, speed limits have been raised. But the commission has insisted on keeping the freeway speed limit at 65 in western Oregon even though it has the authority to raise it to 70 mph. On Interstate 5 from the mid-valley south to Medford, what the speed signs say and what the traffic does are rarely the same. The average speed of passenger vehicles hovers somewhere north of 70 mph. Trucks are slower, but usually not as slow as 55. 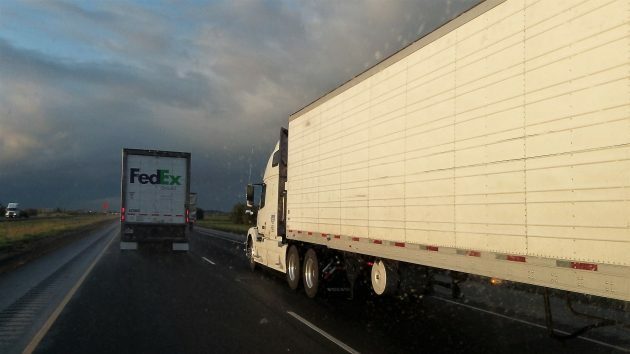 The speed difference between trucks and other traffic has two effects. One is that in moderately heavy traffic, the capacity of a two-lane freeway is cut in half — to one lane only — as everybody stays in the passing lane. Nobody wants to be stuck behind a truck, unable to get back in the other lane. The other effect happens when one slow truck is passed by others just a tiny bit faster. The left lane clogs up even more, testing the patience of drivers and putting their good sense to the test. While traversing the country over the last few years, I’ve found that most long-haul trucks settle in at 60. Congestion occurs when a 60boy wants to pass a 55boy. Common HH everyone pushes the posted speed now. Raising it by 5 mph means the average driver will push his speed up another 5. Also, why is it that I can be driving 65 on I-5 between Eugene and Portland and semi’s pass me???? A futurist thought: when driverless trucks become a reality we can build an inland freeway (like highway 97) for trucks only. The trucking industry is ripe for introduction of driverless vehicles and they would feel no need to pass one another to gain one mile per hour advantage over their fellow trucks like today’s drivers feel compelled to do. Hey, there’s a Trump infrastructure idea! The Red County Truck Network. Jobs (at least thru the next election) and drill-baby-drill forever (if Trump manages to kill all start-up incentives for non-fossil fuels). Maybe local support for 100 MPH speed limit. I understand the intent, but the phrasing is, well………. My apologies to occasional weekend auctioneer. Parts of E Oregon used to be 80 MPH for cars on I-84. Raise the speed for trucks, but enforce heavily for speeding. Stiff fines for doing so will be a deterrent for the others.